MATERIALS:10 balloons,1 black pen,1 white paper,4 color cardboard,1 white paper for writing the numbers. 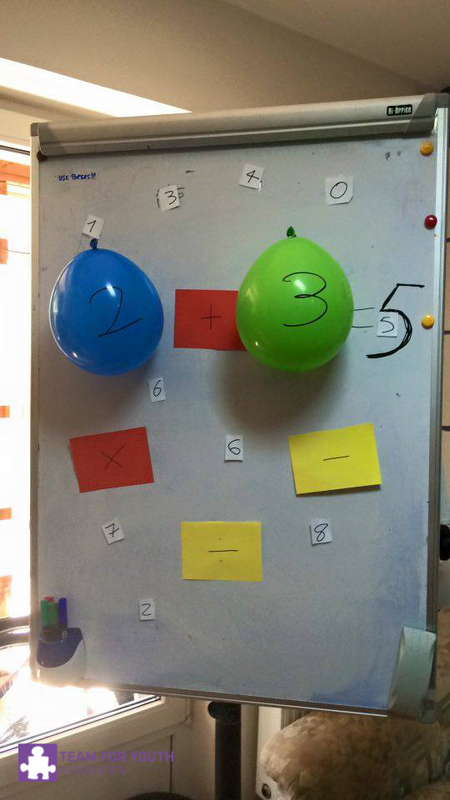 write on each balloon a number from 0 to 9.
spread the balloons in the room. bend the numbers that have been cut and mix them in a glass. take a number from the glass. For example, you take +, the simple operations. ask children to find two numbers that add up to give the results, they can also combine the numbers, for example, they can create a two-digit numbers starting with single-digit numbers. going on with the game, changing the operations, we pass by addition, subtraction, multiplication and division. EVALUATION: The children are happy and curious for this new game. They start to like learn mathematics in an alternative way. Increasing the difficult of the operations it becomes more attentive and motivated. RESULTS: Children are not frightened by the fear of making mistakes or being judged. Try to adjust the difficulty of the tasks according to age. Keep in mind, is not a competition, children can help each other. Of course they can use their finger or paper to calculate.